This Saturday, July 16th, at the Irma Freeman Center for Imagination, from 7:30 to 9:30, is the launch of With a Deepening Presence. Books will be available for purchase and signing. Presence will be sold at the special reading price of $8. Reading will be Kristofer Collins, Christine Starkey, Che Elias, Scott Pyle, Rosaly Roffman, Bart Solarczyk, Bob Ziller and myself. Food and drinks (water, beer) will be provided. 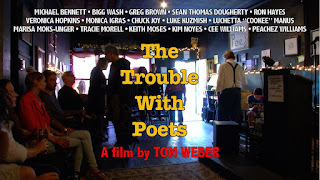 If you can't make it (or even if can), I'll be reading the night before at the screening of Tom Weber's film, The Trouble with Poets, at Pittsburgh Filmakers (477 Melwood Avenue, Pittsburgh), from 6:30 to 9:30 pm. The Filmmakers reading will be a general overview of my work. The launch reading will focus on the new book and a raft of all new poems never performed before. So, two nights, two very different readings. Hope to see you at one or the other, or both.